RUSH: There’s something else going on out there that is a classic misinformation campaign, that is typical of what happens with the Drive-By Media and Trump. Now, normally this kind of story wouldn’t even deserve a mention on this program because in the normal flow of things it would be boring, and it still is boring. But what makes this newsworthy is the latest effort by the Drive-By Media to cast Trump as somebody unsuited, unfit, immoral, dictator-like, tyrannical, and it’s all about the directorship of what is called the Consumer Financial Protection Bureau, the CFPB. Now, I wonder how many people even knew that this agency existed before this latest controversy popped up? To give you an example of the controversy, here is a story from TheHill.com, and the headline: “CFPB Deputy Director Sues Trump to Block Mulvaney as Interim Leader — The deputy director of the Consumer Financial Protection Bureau (CFPB) on Sunday night sued President Trump in order to block Office of Management and Budget Director Mick Mulvaney from taking over as acting director of the agency. English’s complaint — again, Leandra English, who wants the gig — her complaint is that she is the rightful acting director of the Consumer Financial Protection Bureau because she was appointed by the acting director, and the court should therefore bar Mick Mulvaney from taking the job. Now, what is Dodd-Frank? Well, it is an absolute disaster. It was passed in 2010. 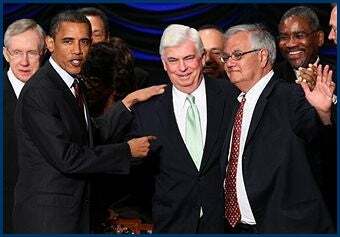 The Chris Dodd, Barney Frank Act established the Consumer Financial Protection Bureau and “called on the bureau’s deputy director to serve as acting director between Senate-confirmed chiefs,” or head honchos. Cordray promoted English, his chief of staff, to the deputy director position shortly before resigning from the bureau on Friday. Okay. Some legal questions are indeed tough. There are some real snafus out there. I mean, you can encounter some legal questions that are real mind twisters. But this ain’t one of them, folks. The question of who should lawfully be considered the acting director of the Consumer Financial Protection Bureau is not a thorny legal question. There is no doubt, there is no alternative to the fact that Donald Trump, the president of the United States, has the power to name Mulvaney to the position, as he has done. This creepy lawsuit seeking to block Mulvaney is frivolous, and my buddy Andy McCarthy writes at National Review Online, it’s offensive. Here’s the truth about his stupid agency. This whole Dodd-Frank thing is an absolute monstrosity. It is the equivalent of net neutrality to the financial industry. The Consumer Financial Protection Bureau is in truth, if you want to get really super legal, is an unconstitutional monstrosity that ought to be abolished. The current tiff is a symptom of the underlying disease. The political progressives, the leftists who created the Consumer Financial Protection Bureau sought to make it an independent agency, beyond political accountability and beyond the system of checks and balances. It would be a boon if the dustup over the acting leadership of the agency would spur a case that could invalidate the entire enterprise, which deserves to happen. Now, the Consumer Financial Protection Bureau was the idea of Fauxcahontas, Senator Elizabeth Warren. It was rammed through by a Democrat-dominated Congress in 2010. Under the statute that created the Consumer Financial Protection Bureau, the director is appointed by the president with the advice and consent of the Senate, and the deputy is appointed by the director. There was partisan infighting over leadership of the agency. Finally in January 2012, Obama unconstitutionally installed Richard Cordray as a recess appointment, despite the fact the Senate was not actually in recess. He was confirmed in 2013 ’cause the Republicans never wanted to oppose Obama on anything, not really. Until he had a foot out the door last week, Cordray failed to fill the deputy position after it became vacant in August of 2015. The acting deputy is somebody named David Silverman. Leandra English, the babe that’s filed the lawsuit against Trump, was Cordray’s chief of staff. Cutting to the chase, the bottom line here is that the law granting the director the right to appoint his successor is unconstitutional because the president heads the executive branch. The executive branch is run by the president who cannot be aced out of any aspect of it. And so Trump was merely asserting his constitutional authority to name his own guy in there. Dodd-Frank, if you remember, was the result of the subprime mortgage — this thing, I still get so ticked when I think about this. All Dodd-Frank was was an attempt by the Democrats to continue to shield themselves from the actual mess created by the subprime mortgage crisis. The subprime mortgage — let’s just review for a second. The subprime mortgage crisis had its roots with Jimmy Carter, who had the idea but it was really implemented by Bill Clinton in his second term. And what it was was the federal government threatening lending institutions, banks and otherwise, to loan money to people that would never be able to pay it back so that they could buy homes. It was the American dream, and it was unfair that so many Americans couldn’t afford the American dream. And so Clinton and the Democrats came along and found a way to do it. Make the banks lend money to people who would never be able to pay it back so they could buy a house. Well, that mortgage and every mortgage like it became worthless. What good is a mortgage where no payments are made on it? Because the people that have the mortgage can’t. Janet Reno, the attorney general under Clinton, was dispatched to threaten a number of these institutions with all kinds of investigations on other things if they didn’t comply. So they did. This, ladies and gentlemen, led to a series of events that finally resulted in the financial meltdown in 2008. And let me give you just the short version. All of these original lending institutions held worthless mortgages. They had lent money under force by the federal government to people that couldn’t pay it back. So what do they do with it? Well, they packaged all of these mortgages, these subprime mortgages, and they created investment opportunities. And they sold these package mortgages to other investors. And the other investors that bought these things believed that there was gonna be an endless stream of income by way of people making their monthly payments on the mortgages, which of course most of them didn’t because they couldn’t afford them in the first place. So each new buyer of the packaged mortgages — and they had a name, and I’m having a mental block on what they were called. But they created a specific name for these packaged mortgages. And as they are sold, it finally dawned on the last buyers that we have bought a bunch of worthless paper. It was worthless to begin with. It eventually was a house of cards that fell apart when the financial crisis happened and all sorts of blame began as to who was responsible. Well, I’m here to tell you, folks — I know that you believe and think and know that I’m a partisan guy, and I am, but I’m not dishonest. And I’m here tell you, the subprime mortgage problem is owed primarily to Democrats who had the idea. They will tell you it was well-intentioned, it was all about the American dream, home ownership for every American. Even for those who couldn’t afford it. Now, during the Bush presidency, there were countless congressional hearings to get to the bottom of this, and regulators were brought in and were telling the truth about all this worthless paper being repackaged and bought around, sold and so forth. And Barney Frank, among others, just ripped these regulators and these auditors to smithereens in their congressional testimony. And so the Dodd-Frank Act, as we jump to the end of this, was created as always, the government makes a mess, the government creates a problem, causes a financial panic, and then the very people that cause the problem set themselves up as the great fixers, the great saviors, and they gave us Dodd-Frank, which was akin to Sarbanes-Oxley, which was more hyper-regulation of the financial industry, when it was the financial industry that was ordered to make these horrible loans in the first place. So Dodd-Frank comes along to take the attention away from the Democrats, and they come up with the CFPB thing that Elizabeth Warren created to add further image to the idea that Democrats were looking out for consumers who were being victimized and set upon and ruined by these greedy, horrible lenders. This whole thing is a phony house of cards that was created to cover up and mask the incompetence of Democrat and liberal policy. But it is powerful. They get to regulate the financial industry. And I’m telling you, Washington is wealthiest place in the world. It’s the most powerful, wealthiest place in the world. Three trillion is collected and housed there every year, minimum. And everybody in that town wants some say so over who gets what. And they’re all in there trying to get their hands on that pile of money as well. That’s what Washington actually is about, is all the money coming in and everybody trying to get their hands on as much of it as they can or use of it for other influential or other kinds of power reasons, power related reasons. So now Dodd-Frank still exists, as does this Financial Protection Bureau, which is a sham, it’s a fraud, it doesn’t do anything productive, it lives and breathes with nothing more than an image and reputation that it’s out there looking out for consumers. It’s protecting them against the usual enemies of the Democrat Party, powerful corporate financial interests, when the fact of the matter is, the Democrat Party’s in bed with these people. They’re their primary donors. It’s Hillary Clinton showing up at Goldman Sachs and other type lenders and banks for 20 minutes of speech making, being paid a quarter million dollars a year. And so the sham that the Democrats are regulating these people and making sure they don’t cheat anybody, that’s not at all what’s going on. It’s a protection racket designed to look like you are being shielded from evil corporate evildoers. And that’s why they want to get people in positions of authority running these damn things because of the regulatory power and the proximity it gives the people in the agency to those with the money. And Trump is simply saying, “I’m gonna put my guy over there. I’m gonna put my guy administering this place. You guys had it. It’s not your decision to make.” And so this Leandra English thought it was hers, but Cordray does not have the power, I don’t care what the law says. The law was unconstitutional. So is this protection bureau, when you get right down to it. It’s just the Republicans never stood up to any of it because they didn’t dare stand up to anything Obama did. Trump is, in his own way. And so Trump is exhibiting here yet again a Trump instinct. He fights these people every day. He refuses to buckle to these people once.